It turns out that Battlefield fans complain less when they have to pay for DLC than they do when they get it free. You've probably heard the phrase, "You can't give this crap away," but while it's normally the sort of thing uttered by retail electronics employees trying to unload cheaply-made USB hand warmers, it's also a very real problem for DICE, the studio behind the Battlefield franchise. The company took "a lot of flack" when it released Battlefield: Bad Company 2 maps as free DLC, yet got an almost unanimously positive response when it put out a slightly larger map pack and charged for it. "I know it sounds weird, but people got really upset with us. People said, 'If you're giving it away, why couldn't you give it away earlier?' 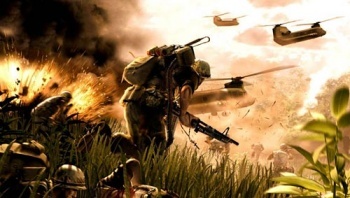 There were a lot of complaints," Battlefield 3 Executive Producer Patrick Bach told OXM. The Battlefield: Bad Company 2 Vietman expansion, on the other hand, which cost 1200 Microsoft points, earned a far more positive response. "It was a bigger pack and we charged for it, but everyone saw the value, and everyone enjoyed the game," he said. Consumers have a much easier time seeing value in bigger expansions that cost money than they do in small freebies, Bach explained, although he pointed out that DICE will nonetheless continue to put out free DLC in the future. "It's just fascinating," he said. "Consumers are not used to getting things. There are no free lunches, and people get very suspicious when they get something for free." First among the freebies for the upcoming Battlefield 3 will be the Physical Warfare pack, a preorder bonus that will eventually be given to everyone. But even that seems to be rubbing some people the wrong way. "People say they don't want to pre-order, so again we just have to say, 'Okay, what do you want?! What can we give you for free? We'll give you a hundred dollars if you play our game!'" Bach said. He presumably later clarified that DICE will not actually give people $100 for playing Battlefield 3. Battlefield 3 comes out on October 25 for the PC, PlayStation 3 and Xbox 360.